Are you interested in Spanish tutoring in Birmingham? We provide a variety of small group classes, perfect for those wishing to invest in either personal or business Spanish lessons. We can help you get the most out of your Spanish tutoring through engagement in small group classes. By learning Spanish in a small group setting you get the benefit of both one-on-one time with your tutor, but you also gain the benefit of interacting with others as you learn. Conversation Spanish is much easier to grasp in a group setting. If you have a group of employees that you would like to learn Spanish, talk to us about scheduling a small group class for your company. We can help your employees learn the Spanish skills they need to succeed in international business relations. If your business interacts with the Spanish speaking world, a group class to learn Spanish could be perfect for your team. Not only do we teach Spanish speaking skills, we also will help your employees learn the nuances of the language. We will focus on the nonverbal cues of the language as well as important idioms and phrases. Are you just starting out on your journey of learning Spanish? We have classes geared specifically towards beginners. We can help you begin to learn basic Spanish vocabulary and the structuring of the language. If you find out that Spanish is a passion, you can always continue on to Spanish tutoring for intermediate speakers. Don’t feel intimidated by starting out. We are extremely happy to help anyone learn Spanish, no matter what knowledge they come to us with already. Better multi-tasking skills: Because you need to swap between two languages, you will gain better ability to use the part of your brain that allows you to multitask. Improved memory retention: As you challenge your brain to memorize new vocabulary and language skills you will actually improve your memory skills overall. A boost in brain power: If you were to start training for a marathon, you would not only become a better runner, but you would also become a better athlete overall. In a similar fashion, when you exercise your brain to learn Spanish, you will boost your overall brain power and strength. 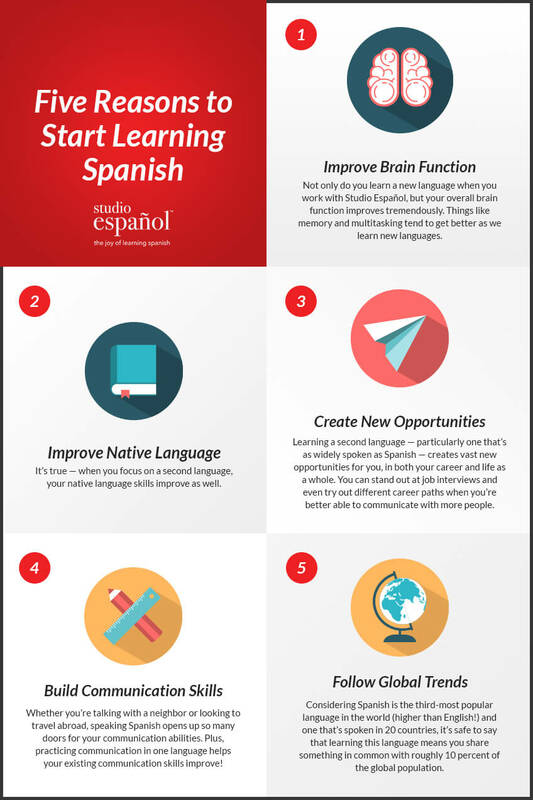 An improvement in your first language skills: As you work on understanding how Spanish works, you will actually improve your grasp on your first language. Talk to us today about our group Spanish tutoring classes. We can help you, or your employees, gain new language skills. If you run a business, you can see how the above benefits would be excellent skill sets for your employees to gain. If you are an individual looking to improve your quality of life, consider joining a small group Spanish class in Birmingham. We also have classes specifically catering towards high school and middle school students. Contact us today for more information about our group Spanish tutoring classes. Are you interested in brushing up on your rusty Spanish skills? Are you just starting the journey to learn Spanish? We offer year-round Spanish programs for all levels. Please contact us to find the best class for you! Our Spanish classes in Birmingham are interactive, fun, and allow for every student to participate. Check out our testimonials below to see what our students are saying about their own experiences learning Spanish at Studio Espanol. Improved Memory: Did you know that learning a new language actually boosts your memory capabilities overall? When you exercise your brain through memorization of a whole new vocabulary, you brush up on your ability to memorize and retain other things as well. Think of it like exercising any other muscle. If you take up running, you won’t just be a better runner. You will also be able to use those muscles more effectively for other activities like biking and swimming. The same is true of your brain. Increased Opportunities: When you become conversational in Spanish, you will find a whole new world of opportunities opens to you. There is a large demand in the job market for bilingual employees, and even if it is not a job requirement, almost any business will see it as an asset. Have you been dying to take a trip to another country? With conversational Spanish abilities, you can choose a Spanish speaking country and actually immerse yourself in the local culture. Ditch the tourist hubs and opt for a local experience with your new language skills. Enhanced English Skills: You may find this counterintuitive, but learning a second language has actually been proven to improve your first language. As you learn the basics of Spanish grammar, you will also be refreshing your knowledge of English grammar. You might be amazed at how much deeper of an understanding you have for your first language after you learn a second language. If you have studied Spanish before please contact us to find the group that is right for you. We can help you delve deeper into conversational Spanish, or we can help you start from scratch. Talk to us today to learn more about Spanish classes in Birmingham.